Princess Elisabeth was born in 1764 in France and was the youngest sister of King Louis XVI. Her mother died when she was only two years old and she was raised by her siblings. Although she grew up in the royal household and castle, she thought the King’s Court was too extravagant and avoided it whenever she could, preferring to spend her time praying, studying, horseback riding and walks. She spent time working a boarding school for girls from impoverished families. She often visited her aunt, Louise-Marie of France, who was a Carmelite nun. Sometimes Princess Elisabeth would cook and serve a meal to all the sisters at the convent. Her good works and acts of devotion earned her the nickname “the Good Lady”. She was deeply devoted to her brother, the king, and she refused to go into exile with her other brothers and her aunts when the revolution took place. She accompanied King Louis to Varennes, then into prison in the Temple, and followed them to her death at the guillotine in Place de la Concorde in Paris in 1794, just a week after her 30th birthday. As others went to their death before her she said to them: “Courage! 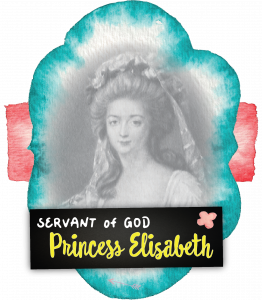 Courage and faith in God’s mercy.” She was executed in the French Revolution for being a catholic monarch. Her cause for sainthood was opened in 1924 and she was declared a Servant of God in 1953. She was an example of sincerity in being true to her beliefs.